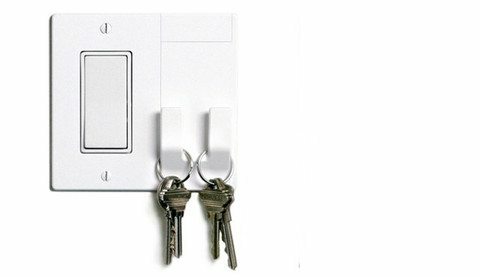 Do you frequently misplace your keys in your house or apartment? Share your keys with others in your household and need a common access point? 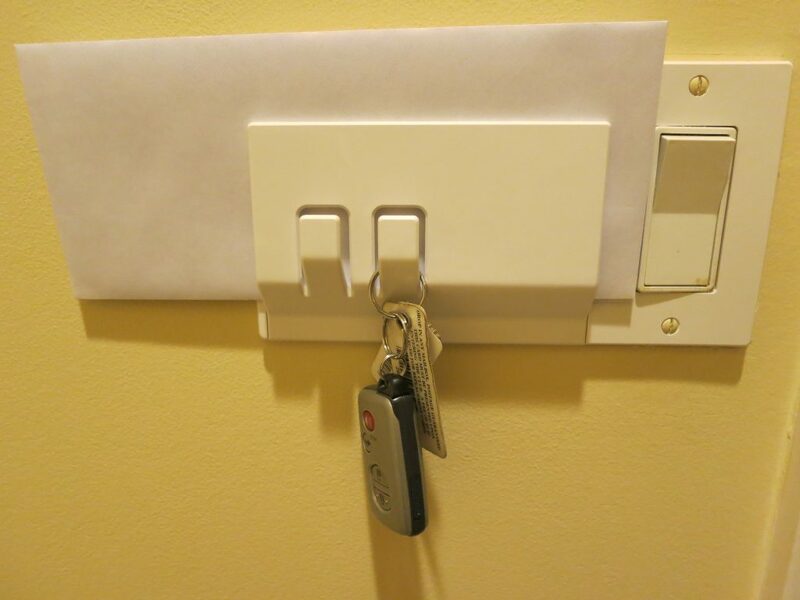 Like to dump your keys as soon as you come in so they’ll be accessible when you leave? Leave outgoing mail near the door so you don’t forget to post it when you go out? Want a leash hook next to the front or back door for your pet? 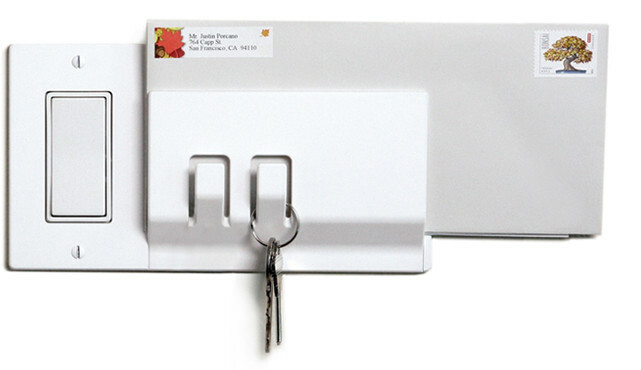 Need a regular place to hang your college ID card so it doesn’t get lost in that mess you’ve made of your dorm room? 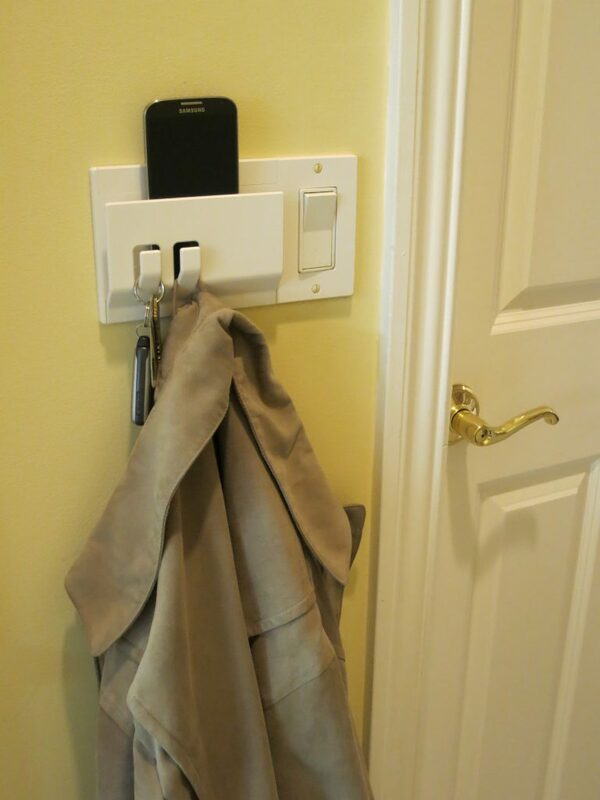 If so, the Walhub switch cover organizer may be just what you need. 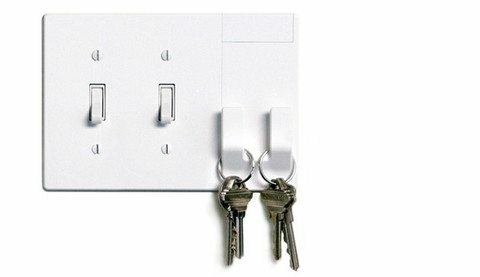 Walhub offers a simple, attractive way to add two hooks and an optional storage slot just where you may need them, next to the light switch by the entrance to your home. Installation is easy – all you need is a screwdriver. Whether this solution works for you depends on your personal habits and workflow. 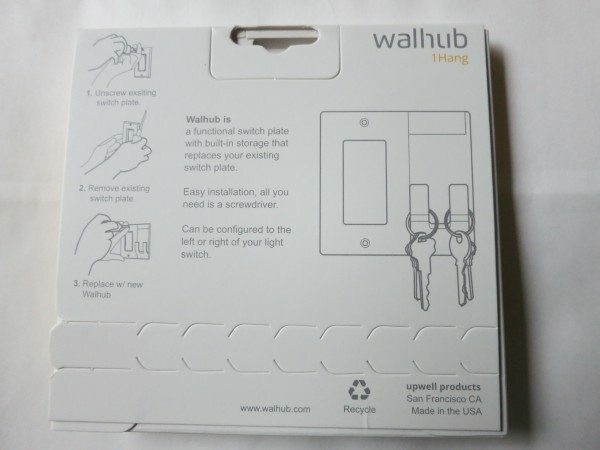 Read on for more product information and my own experience with the Walhub switch plate. Walhub is designed by Upwell Design in California and manufactured by Upwell Products in Washington. Walhubs come in multiple configurations, so it’s likely that one of them will meet your requirements. The first thing you need to do is look at the switch plate where you are considering adding a Walhub. Walhub will replace the existing switch plate, which must be either toggle or rocker style and have either one or two switches. Then you’ll need some space to one side of the switch for the added storage components that come with the Walhub – the Walhub can be converted to add the storage to either the right or left of the switch. Below are some examples from the Walhub site. The image below is a Walhub with the standard two hanging hooks for a single rocker-style switch. 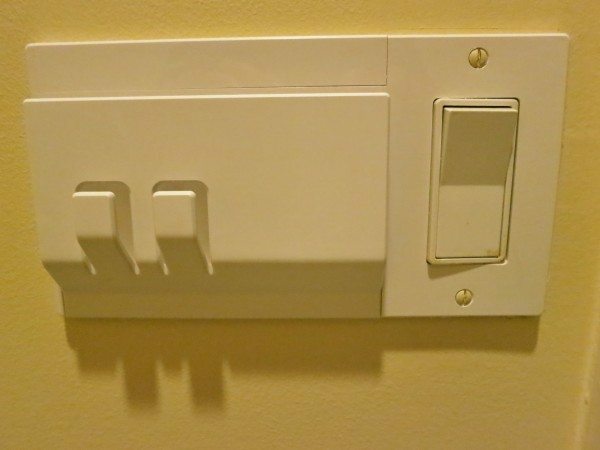 In Walhub lingo, this is called a “1 Hang / Rocker.” This also comes as a “1 Hang / Toggle.” The “Hang” product occupies two inches of additional space to the left or right beyond the existing switch plate. Here is a Walhub with the same hooks for a dual toggle-style switch, or a “2 Hang / Toggle.” There is a rocker variation of this. I received the 1 Hang / Rocker and the Keeper / Rocker to review. I decided to install the Keeper / Rocker for evaluation, since it just adds the additional slot to the smaller Hang product. 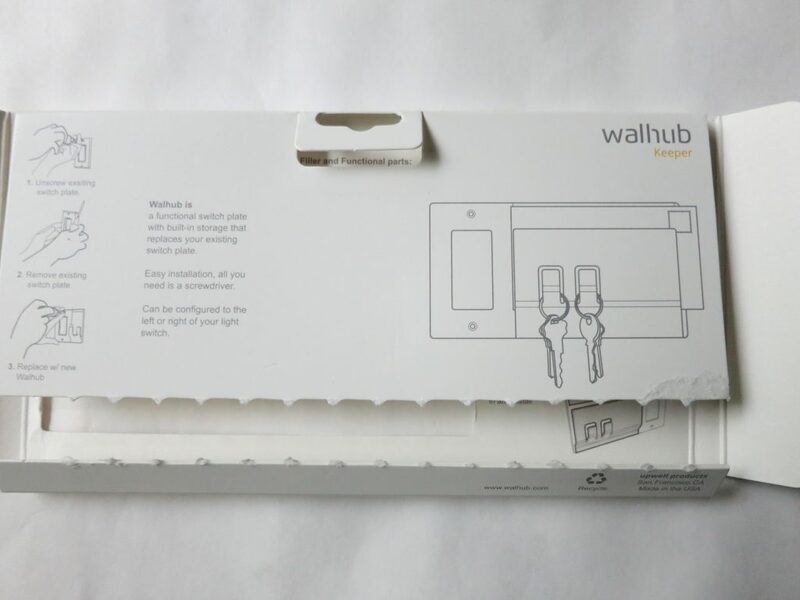 Like the product itself, Walhub packaging is clever, attractive and minimal. It is also recyclable, which is always welcome. The front of the package is a picture (with the actual hooks poking through) of what the installed product will look like. Note: All images from this point on can be clicked to view a larger size. 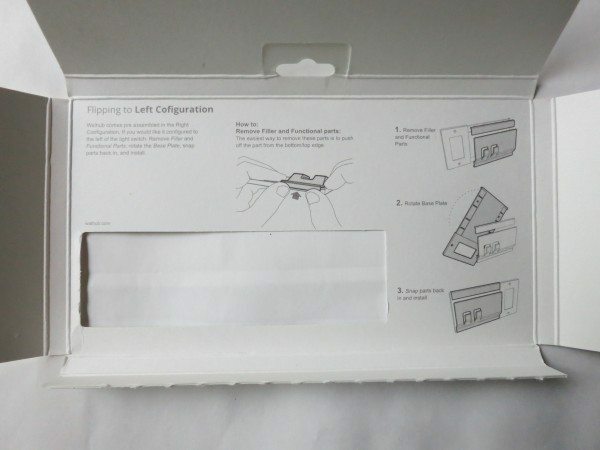 Here is a picture of the back of the 1 Hang package, which includes simple installation instructions. The Keeper package is much the same. Inside the packaging are more instructions for how to reverse the configuration from left to right, if necessary. Here I found the only minor flaw in what was otherwise a meticulously-designed product package. Can you spot the typo below? Both the Hand and Keeper products include two screws to attach the Walhub to the underlying switch box, although you can use the existing screws from the old switch plate. 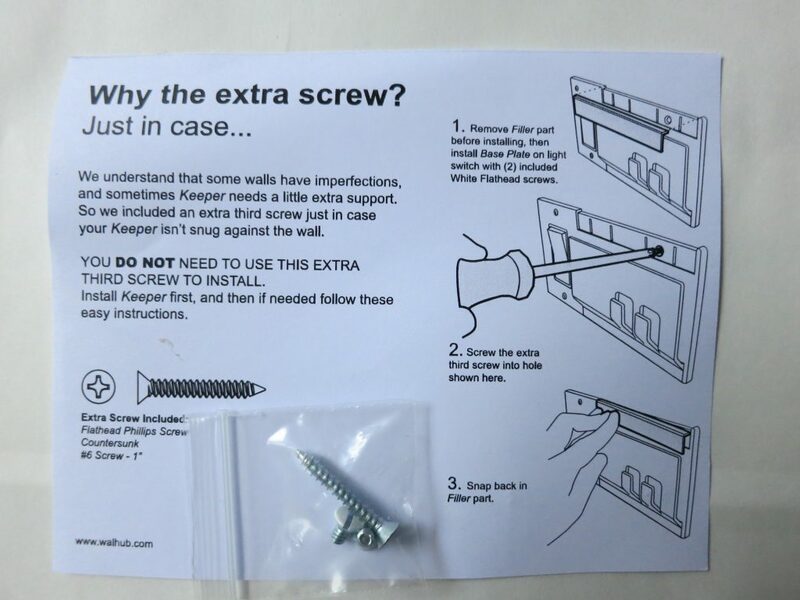 The Keeper Walhub also includes an extra, longer screw which can optionally be used in the frame extending from the switch box. Use this if your wall is uneven to eliminate a gap that may appear between the wall and Walhub, or if you plan to hang heavier objects from the hooks. 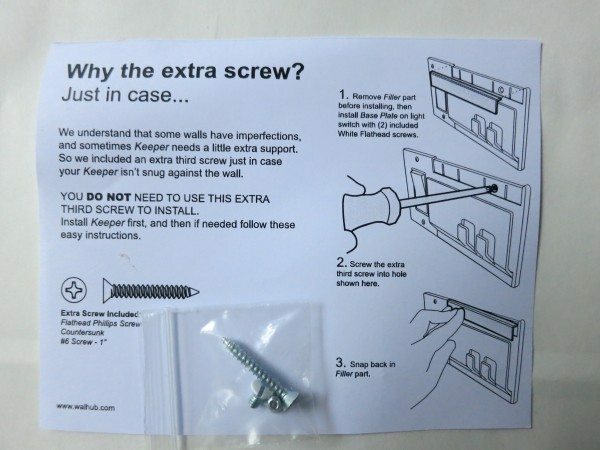 Here is a photo of the extra screw and instructions. I took a photo of the type of product use for which it may be advisable to install the screw for extra support. However, although I did not use the anchor screw, I did not notice any strain or stress on the switch when I hung the jacket. The quality of the plastic and finish is smooth and sturdy. As long as you are okay with the white color, there is little cause for complaint on the Walhub’s appearance. My wife did express surprise that I would want to install a device like this, because I usually like to keep clutter behind closed doors or drawers (except in my messy office, but that has a door!). It’s a valid point, but I think that the overall look is neat and clean enough that it wouldn’t bother most folks. Once I got the Walhub installed, the question was whether it worked and if it would change our entry/exit habits. It did work as exactly as advertised. My only minor gripe was that the hooks were just barely large enough for my ¾” key ring, but that could be resolved easily with a larger ring. The biggest reason why the Walhub never really caught on in our house is that we already have a system that works for us. There is a closet to hang things. We have room for a table where we’re used to placing and looking for outgoing mail. We have two cars (with two sets of keys) so we don’t often need to share keys. And, when they are not in my pocket, I like to keep my keys in my office with my wallet. Keeping them together means that I’m less likely to leave my wallet behind when I go out. The Walhub would have been very useful when we had multiple teenagers in the house sharing a car. Arguments, over who had the keys last and where they left them, led us to add a nail in the pantry to hang the keys – out of sight but not the most convenient location. The hooks also would have been handy while we had a dog in the house to keep the leash by the door. So, while we will be putting the original switch plate back in place of the Walhub, I would still recommend the product to anyone who needs a better way to store items near the entryway. 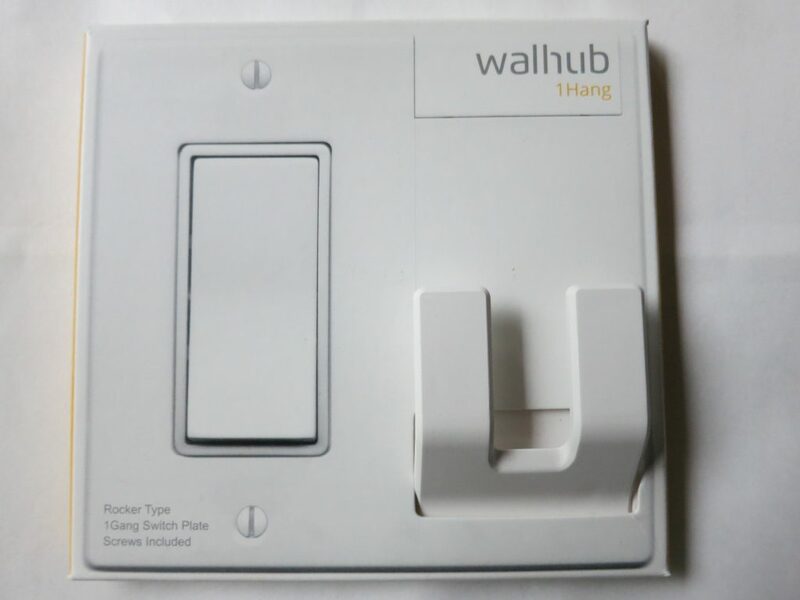 Walhub pricing is quite reasonable, ranging from $9.95 for the 1 Hang product to $15.95 for the Keeper. In addition, recognizing that this could be great gift for students in small dorm rooms or apartments, there is currently a back-to-school sale with a 20% discount off all Walhubs and free shipping on orders over $25. It’s a good time to think about whether you, or someone you know, could use a little more organization when entering and leaving the home. Source: The samples for this review were provided by Upwell Products. Please visit their site for more info about this product. They left out the “n” in configuration. 🙂 Good catch! @John, Well done! Both of my sample Walhubs came with the typo, so it seems that the error may have made its way to all of the product line. I hope they didn’t have too large a print run on the packaging!